Glass-mounted panoramic colour print Rhein II, created in 1999, is one of an edition of six works. Others hang at New York’s Museum of Modern Art and London’s Tate Modern. It beat the previous record of $3.9m (£2.5m) achieved by an untitled 1981 colour print by Cindy Sherman, who is the subject of all her own works. Gursky’s print had a pre-sale estimate of $2.5m-$3.5m (£1.6m-£2.2m). Rhein II is the largest of the six photographs, which are produced in various sizes. As well as in New York and London, other photographs in the edition are housed in Munich’s Pinakothek der Moderne and Glenstone art museum in the US. 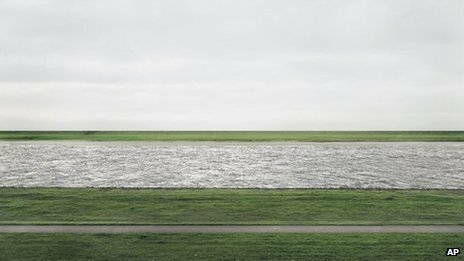 Gursky has spoken of “a particular place with a view over the Rhine which has somehow always fascinated me, but it didn’t suffice for a picture as it basically constituted only part of a picture”. He said he “carried this idea for a picture around with me for a year-and-a-half”. “In the end I decided to digitalise the pictures and leave out the elements that bothered me,” he added. Christie’s said the viewer was “not invited to consider a specific place along the river, but rather an almost ‘platonic’ ideal of the body of water as it navigates the landscape”. Wow….I’d like to get millions for a digital image that is exceptionally boring. This image reminds me of many I’ve deleted due to being well…like this.